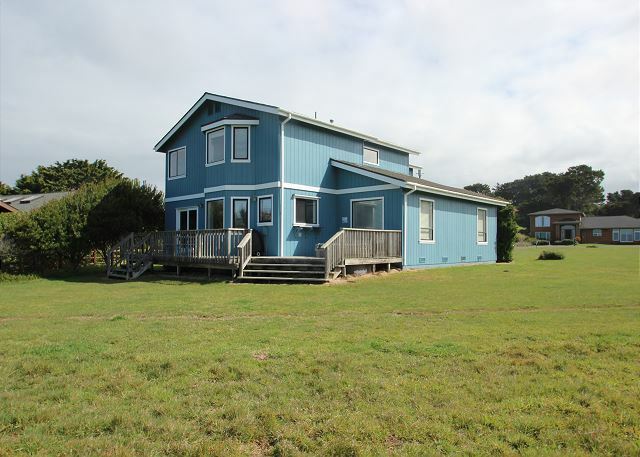 Welcome to Sea Haven, an idyllic and modern home just minutes from Mendocino and Fort Bragg. 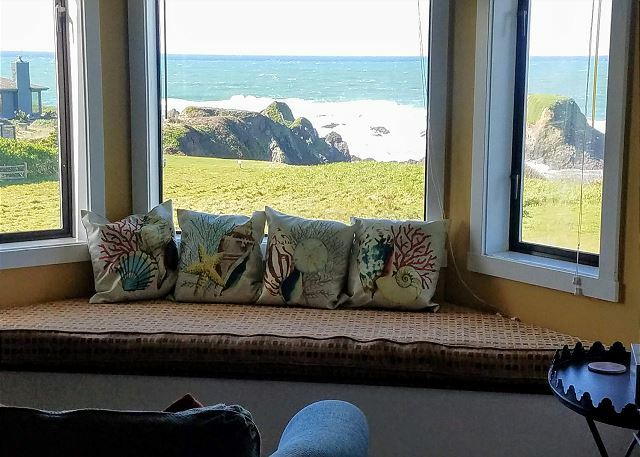 On the ocean with nothing between you and Japan to spoil the view, it’s pure comfort for up to six people - with three bedrooms & two baths and just three miles from Mendocino. 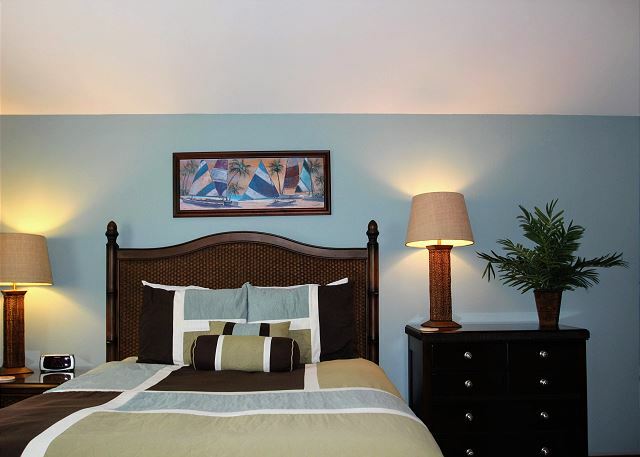 Sea Haven is warm, cozy and comfortable, beautifully furnished and decorated. And when night falls, glory in the sunset... then gather 'round in the open-spaced kitchen-living room area, or cozy up to watch a favorite DVD. Indulge yourself -- what are vacations for? From your front door it is less than 1/2 mile walk to Point Cabrillo State Park that includes the historic 1909 Light Station (30.5 acres), approximately 270 acres of undeveloped coastal bluffs and prairie and numerous coves, including Frolic Cove, the site of the shipwreck Frolic. Also within a 1/2 mile walk enjoy Caspar Beach which offers rental of paddle boards, surfboards or kayaks. There’s a back deck where you can luxuriate in the hot tub... or watch over a surging ocean as it breaks over the off-shore rocks. 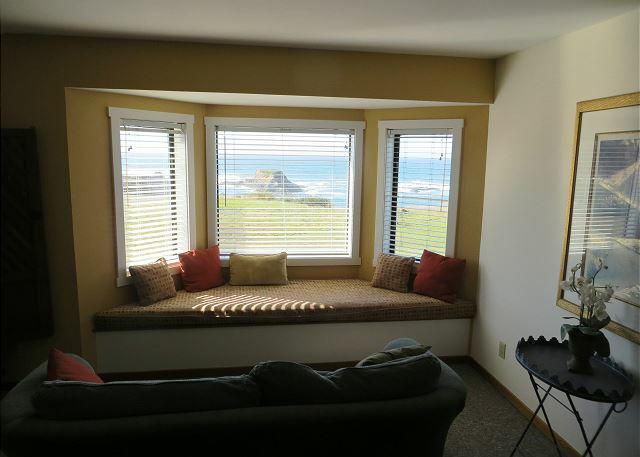 Upstairs, snuggle up, let the sounds of the ocean lull you to sleep or just sit back and read a favorite book... or get lost in the views from the window seat. WE had great peaceful time in Sea Heaven. The ocean view from the windows is like a picture. Great privacy, places to hike and enjoy. We had good thanksgiving dinner we cooked in the house. The house is now for sale, it is an old house, furniture style is a bit outdated, and some doors need maintenance work. Service and support was excellent. We had great time. Peaceful with spectacular view. We had everything we needed. Close to lots of good restaurants! Fun hikes and beach in walking distance. The rental property was emaculate! Very spacious, super clean, beautiful view, easy to find! The only thing we wished to be different was the hot tub temperature was way too hot to get into so we unfortunately didn’t get to use it and also was lacking in paper towels. Other than that it was perfect and we would definitely go back! When we arrived, the entire set of keys, for all the vacation rentals of this management company, were in the front door of the house, and the door was left wide open. We were a bit frightened and were concerned with our safety. Upon getting into the vacuzzi that evening we found that the heater was busted, therefore we were unable to enjoy the spa. Thank you for your feedback. We are sorry for the confusion upon your arrival, one of our service people was working in the neighborhood and forgot to close up when they left, we have addressed the situation with them. Regarding the spa, we do have a technician check them prior to each arrival, however sometimes things happen that we cannot control nor foresee and the best we can do is to get it repaired ASAP. We hope you can understand. Thank you very much for being our guest and for providing your feedback. The home was in a great location and the view couldn't have been better. We enjoyed the deck and hot tub. The home was clean upon arrival. We enjoyed our time and wished it lasted longer. We had a great stay. Check in was a little difficult because we were unable to locate the check in lock box code and were also unable to reach anyone at the 1-800 number. We found another real estate agency in town who knew the personal number for a staff member at Mendocino Vacation Rentals and they were kind enough to call and get the lockbox code for us. Hi Ann, we're so glad you had a nice trip. If you ever have any problems in the future, please know we have a 24 hour answering service that can give you information or get in contact with our staff that can be accessed by calling our office number. Thank you very much for the review and for being a valued guest. This is a wonderful, well stocked house. The kitchen is perfect for family cooking and dinners. The views are wonderful and it is a great area for walking. We had a terrific time staying at Sea Haven. 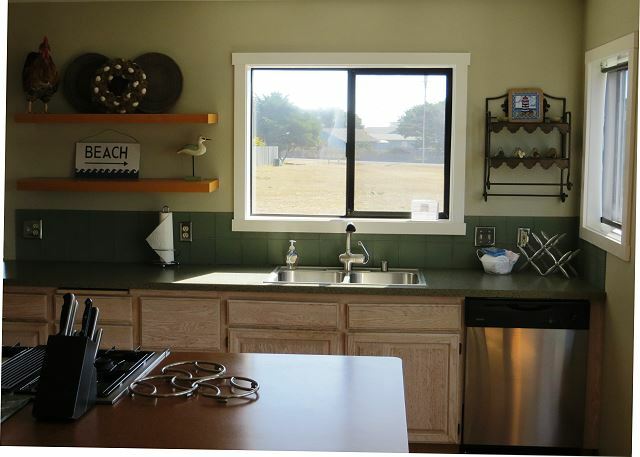 The house was well furnished - with a great kitchen/accessories. The location was perfect for our dog to play outside in the big yard while we hung out at the house. 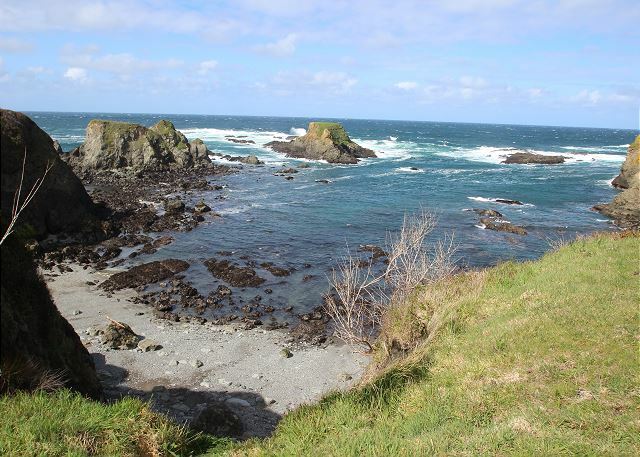 This location is great access near Highway 1 to explore the coast - Fort Bragg and Mendocino area. Will come back for sure! Staff was very friendly when I picked up the keys. The location is wonderful. The house is comfortable. Nice house, great location, and even better view. The furniture is comfortable. The kitchen pots and pans are very dated. Hello Scott, thank you for the feedback. We wanted to let you know that we have ordered a new set of pots & pans so if you stay at Sea Haven again that will not be an issue. Thank you for staying with us! Hot tub and deck overlooking the ocean. View of the water from the kitchen, family room and master bedroom. Fabulous birthday event. The management was very thoughtful and responsive. I highly recommend! We had a large family gathering to celebrate my mother-in-laws 60th birthday! Our group was 5 children and 8 adults, everyone slept comfortably and the living area was very accommodating! Home was very clean and beautifully decorated. Easy access to some beautiful walks. Although hot tub could be a little more private, we enjoyed it every day. Bring some type of device to play music on since we could not find any type of radio or stereo. 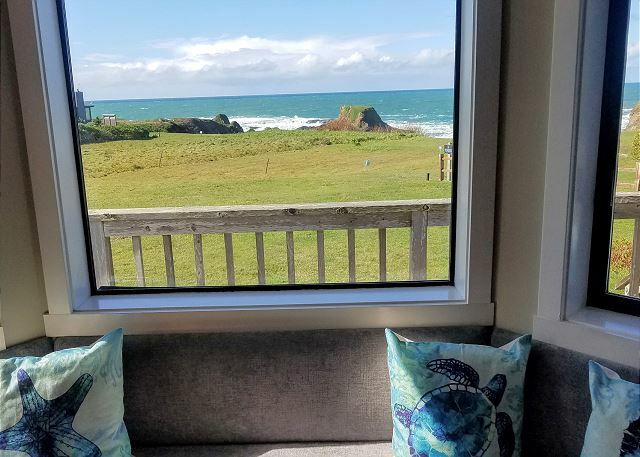 We originally were booked at other rental house but it was not available due to some repairs, so we were grateful that Mendocino Preferred gave us the Sea Haven as an option. Our experience could not have been more perfect. Sea Haven is exquisite. We truly were sad to leave. We look forward to our next trip and will make sure Sea Haven is available. Absolutely perfect in every possible way!! We would stay here again in a heartbeat! Definitely do the walk to the lighthouse and checkout the walk down the stairs to a secluded cove while you are at it!! We saw seals, whales, deer and so much more wildlife. Enjoyed my time at Sea Haven. House was very comfortable and the view was spectacular. A special thanks to the owners and Mendocino Preferred, the company who manages it. William B from San Francisco, CA does not recommend this vacation rental. Sitting above the bluff, the view is spectacular! But the house is in need of some repairs and upgrades (it is for sale). 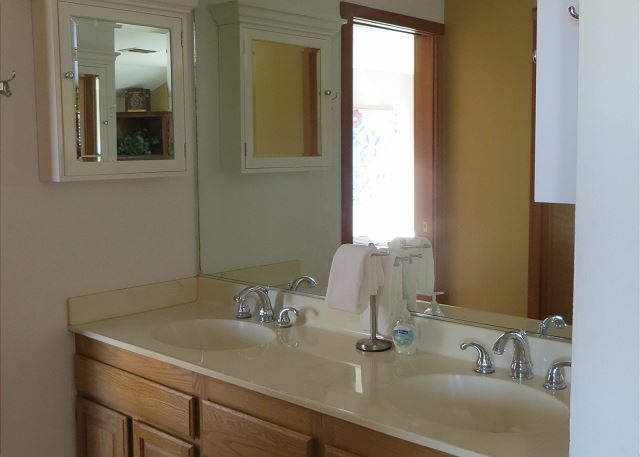 The faucet in the shared shower needs to be replaced, sink faucets had problems, the dishwasher soap dispenser was not operational, dimmers on light switches are an old style and flicker -- none of these major, but there are nicer properties in the area. The house was very nice. The Decour was tasteful and it had plenty of room for people to relax the only drawback was that it was a little chilly and there wasn't any extra blankets. The Ocean overlook was breathtaking I was here for my birthday my friends and I all loved it I would recommend this place in a heartbeat. We had a great time. All was good. This was my 3rd stay at Sea Haven. I've had to be in the area several times in the last year due to business. 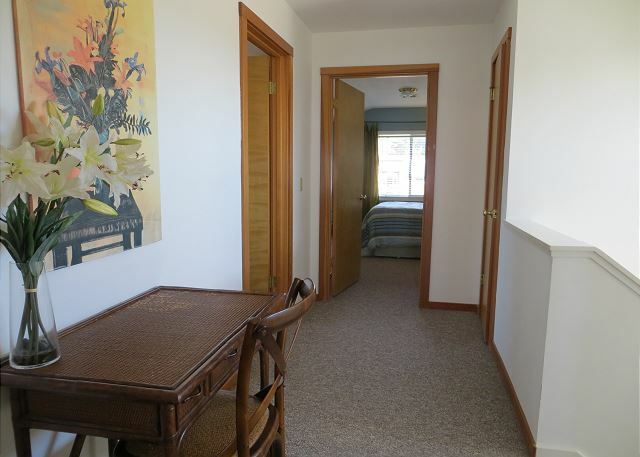 The house is comfortable, with several different living areas. 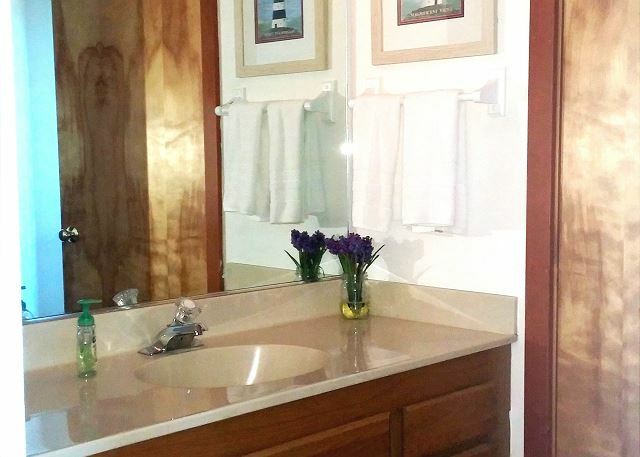 The master bath and bedroom have excellent views of the ocean. The kitchen is easy to work in. The house is decorated in a style that appeals to me. The home is spacious and very clean. We enjoyed listening to the ocean at night and watching the whales from the deck during the day. We shared the home with another couple and we had more than enough room. We are looking forward to making this an annual trip. Thank You Mendocino Preferred we will be back. We had a wonderful time with our family in Sea Haven. There was plenty of room for all of us. The view was amazing. The house was very comfortable and clean. There is a nice path to the lighthouse, as long as it is not muddy. We did find that there were some important items in the kitchen that we had to buy, that were either missing or no backup suppy. For example, spices, coffee filters, sponges, paper towels, extra toilet paper, and starters for fireplace. We would definitely stay again in Sea Haven. lots of great views of the ocean and deer. 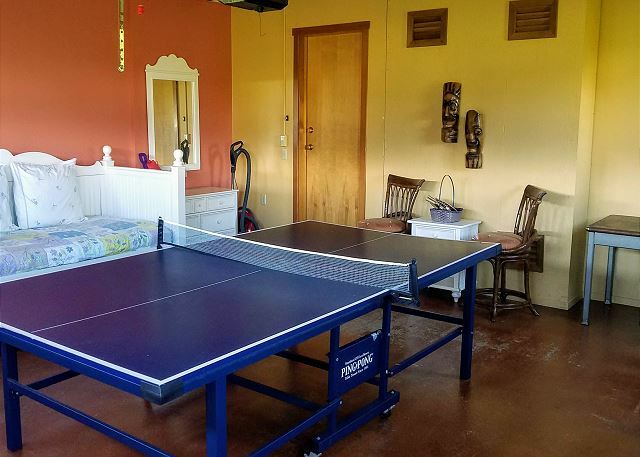 Ping pong table was a nice addition. I traveled to the Mendocino/Fort Bragg area to attend to Estate business. It was a trip made rather quickly with limited dates available for me and I since the places I regularly stay at were fully booked, I was happy to find an affordable place close to the ocean for the dates I needed. Sea Haven was comfortable and I was able to spread out and get the work done that I needed to do, along with enjoying the sound of the ocean every night as I drifted off to sleep. we have been coming to this place for many years. 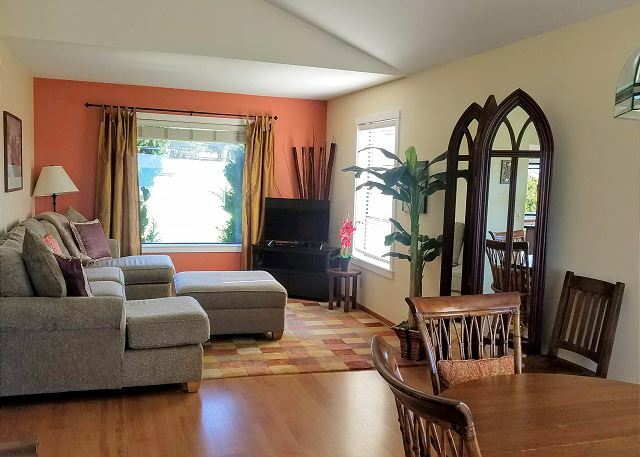 we think this is a perfect location with a beautiful ocean view, easy hikes to a small beaches and the PT.Cabrillo light House , close to both towns of Mendocino and Fort Bragg for browsing and shopping. One little thing; there are only enough silverwares for one meal and we had to wash them often before the dish washer got filled up. Waste of water! Overall we were very happy and had fun. We very much enjoyed our stay at Sea Haven. 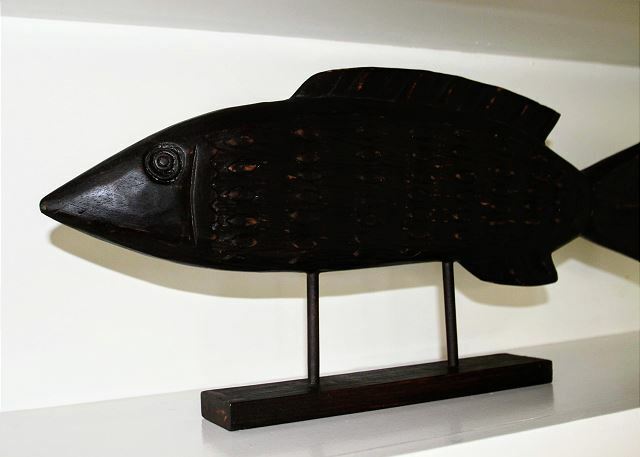 The house was comfortable and spacious and the kitchen well equipped. Watching the sunsets from the back deck was a favorite. This was a fabulous house and experience. Just excellent, no complaints, other than the house needs THROW blankets... blankets/throws around the house for sitting on couch, etc... it is cold/stormy outside during winter, and the throws are very cozy while sitting. We had to use another bed's blanket for that. Also, pillows need improving. They are not comfortable, need new bed pillows. Other than that, just a wonderful place! This property was amazing. Comfortable, right on the beach, peaceful. Clean and well taken care of. We would definitely stay here again! We explored glass beach, awesome! And also walked down the street to Caspar headlands and explored there. Absolutely beautiful trip all around. Would definitely recommend Mendocino preferred for your booking and sea haven for a place to stay! The trip to the Mendocino area for the holiday was a wonderful choice and Sea Haven was the perfect retreat. The view of the ocean is amazing and every day the view gave a new and breathtaking landscape to enjoy. 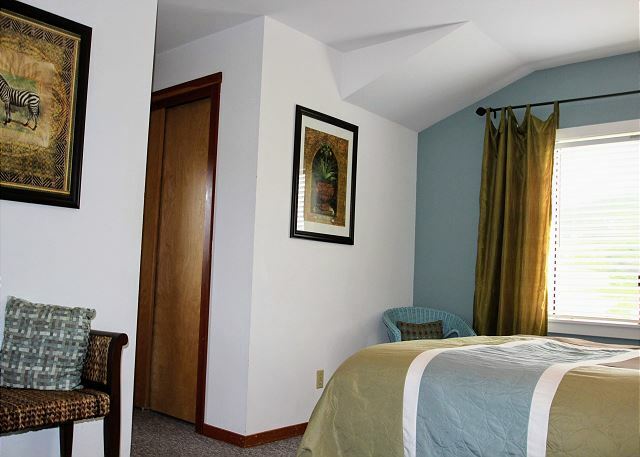 The house was very clean and conveniently situated to town, hiking trails, etc. 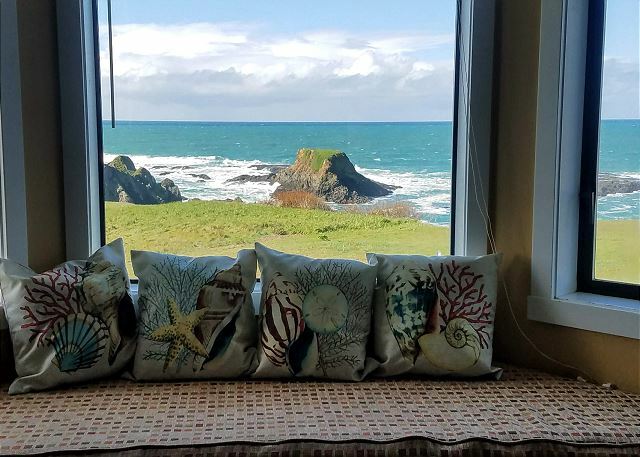 I would highly recommend for a get away to the north coast. What a view! We had such a nice time at this home. Opening the windows at night and listening to the surf (and distant barking seals -- what fun!) is something I don't think we'll ever forget. We are already looking forward to staying at the Sea Haven again. We had an amazing time at Sea Haven. The house was impressively clean and the team had put up some some personalized notes for us. Can't beat the location and the ability to bring pets. Thank you for a great experience! We stayed there with a group of 6. The house is right on the bluff with unobstructed views of the ocean. It's a few miles North of the main village - in a very quiet neighborhood - perfect for a relaxing week-end. The house is very well appointed. We had rented Sea Garden as well and the 2 houses are just next to each other, which was perfect for our group. In all we had an awesome time. great location and great views! It was pretty nice, the view from the master bedroom was amazing. We did find the master bedroom bed a bit hard, so I had to sleep in an another one of the rooms unfortunately, and we question whether it was a king bed, as the measurements measured as a Queen. The kitchen was well equipped with pans & utensils for cooking, as we found some of the Mendo restaurants a bit of a disappointment. I would say all in all I would give it a 3.5 to 4 star experience. This is our 3rd year at Sea Haven. We have always been very happy with the condition of the house and the location is fantastic. This year was especially nice with the new carpeting and paint. 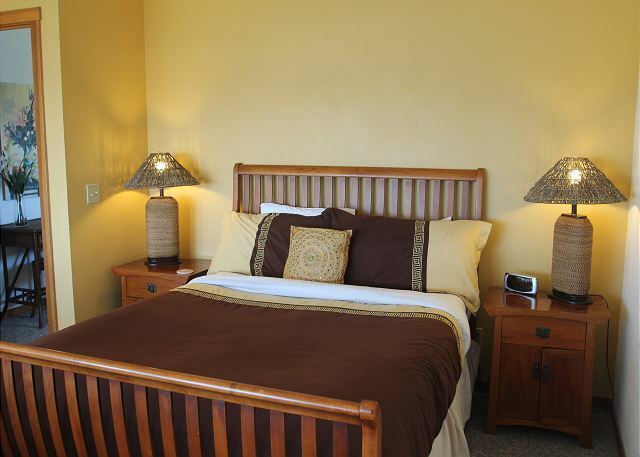 We feel Mendocino Preferred does a great job taking care of their guests. Thank you!! We have been staying at this place for more than a few years annually. the ocean view is great. Easy access to Mendocino town and Fort Bragg. the house is spacy and is always clean . Towels were getting a little bit old and the master bedroom bedding had faint dog smell. It will be great if they can replace those chipped plates and bowls. Overall we loved this house and had a great stay. Super location. Unobstructed views of the ocean. Walking distance: Point Cabrillo Light House, seal viewing at cove near home, and Casper Beach. The home is OK. It is worn in areas and needs some upgrading. The beds were too firm for our comfort. We purchased and added a memory foam topper to master bed or we could not have slept well. The staff was helpful. We added 2 housecleaning visits to our 17 night stay - excellent job there. (We could smell dog on the family room couch, which is worn.) the garage had a fish smell and was a bit messy. Even though it had a ping pong table we didn't use it. Best place in the house was the master bedroom couch looking out on the rocky ocean and the master soaking tub with the same view. 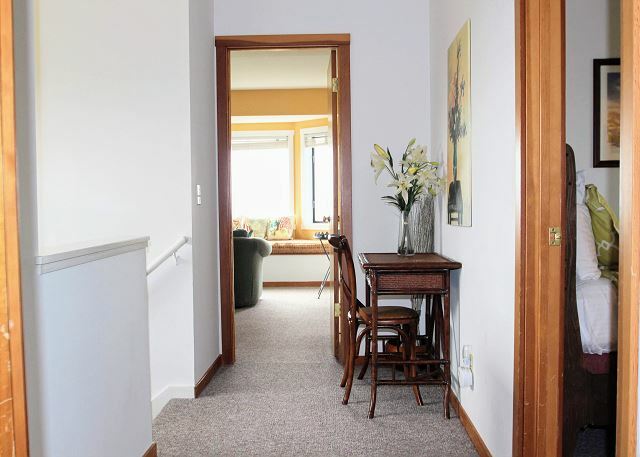 This was a comfortable home with beautiful views of the ocean and a short walk to the bluff. Loved hearing the seals barking from the bedroom window. A lovely getaway. The location was wonderful. 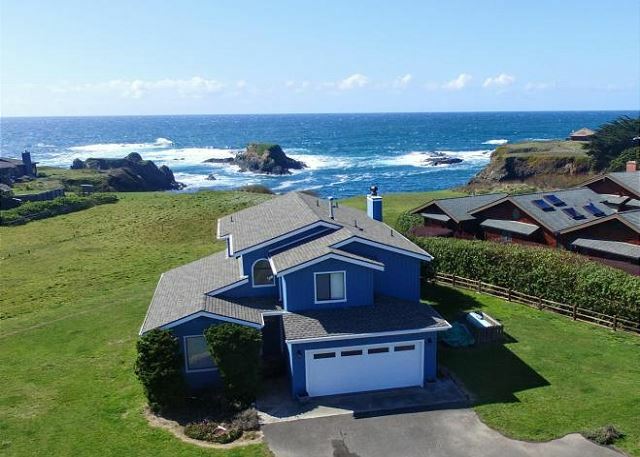 Very private yet close to Fort Bragg and Mendocino. Loved looking at the waves and gulls. The property is a little outdated however for the price. Could use some updating. We had a wonderful time at Sea Haven. 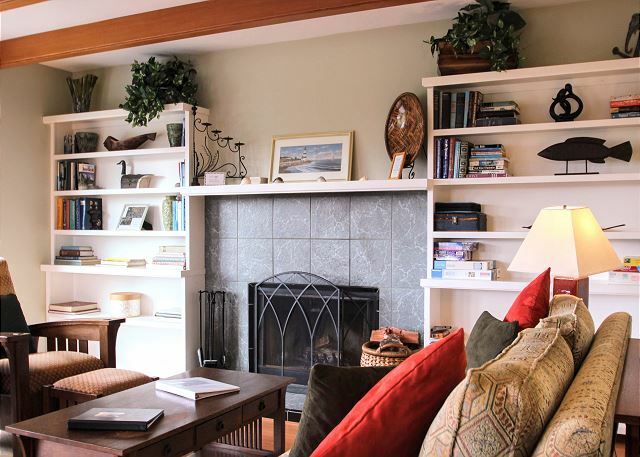 The location is perfect for being close to both Mendocino Village and Fort Bragg. We were there to spend time with family and relax, it worked and we are feeling very rested. We visited this place with 2 more families this spring, and had the best vacation ever. 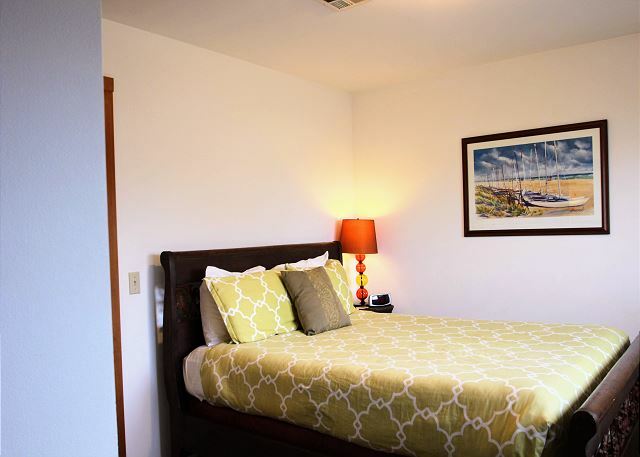 The rooms are cozy and have all the amenities. Plus the sunset views are great from the main bedroom. Would definitely recommend this property to all out friends.